February 2017 outperformed January 2017 but did not eclipse the pace set in February 2016. Total units sold numbered 447 last February compared to 399 this year. However the dollar volume was higher at $211.6 Million compared to $198 Million last February. Similarly, 190 homes were sold this February compared to 194 last year, but the current dollar volume was $121.3 Million compared to $107 Million last year. This points to higher prices in the current market and very low inventory levels. The total number of units for sale totaled 2,748 last year at this time compared to the current 2,114. This is a decrease of 23%. Low inventory levels will continue to be a challenge all year. New inventory will come forward in the Spring but there is a pent-up demand which will cause a quick sell-through. There are currently 491 single family homes for sale. So far we have sold 293 homes in 2017 compared to 280 last year, but the gross dollar volume is up 20%. We have sold 160 apartment stratas compared to 148 last year with 18.7% increase in gross dollar volume. Townhomes continue to be popular, causing a supply challenge with 103 sales this year compared to 118 at this time in 2016. The average house transaction price stands at $627,000 year to date. The market continues strong in seller’s territory with days to sell sitting at 62 days for single family homes and the list/ sell ratio continuing at 98%. 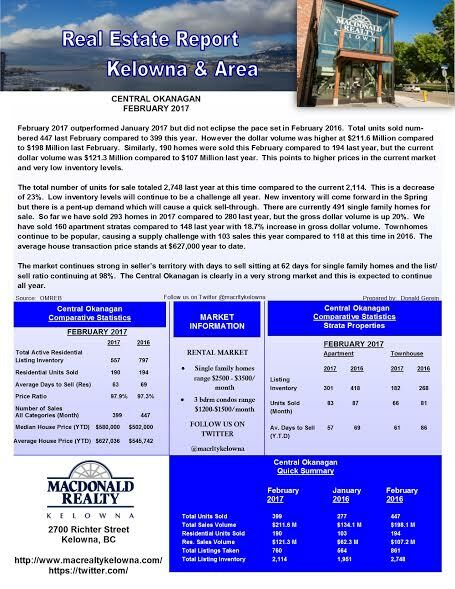 The Central Okanagan is clearly in a very strong market and this is expected to continue all year. How does February 2017 Compare to 2016?